Call us at 770-487-2020 today. 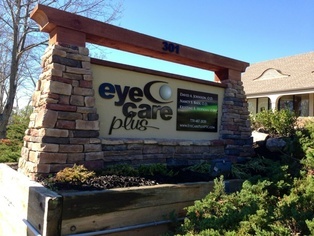 Welcome to Eyecare Plus, where high-tech blends with a personal touch to provide for your vision and eye care needs. Our doctors utilize the latest in diagnostic equipment to analyze, diagnose and treat your eye and vision conditions. You will find we have a knowledgeable staff, flexible appointment hours and an extensive selection of frames in our optical shop. Our on-site optical lab allows quick and accurate production of your prescription eyewear by our licensed opticians. We have thousands of diagnostic contact lenses at our fingertips to provide you with great vision comfortably and efficiently. Our one-on-one approach to optometry makes Dr. Johnson and the Eyecare Plus staff the eye and vision care providers of choice in the Peachtree City area. Our Peachtree City optometrist offers the following services: complete eye exams, contact lenses, glasses, glaucoma testing, and pre- and post-operative care. For a complete list of services, visit our services page or call our Peachtree City office at 770-487-2020. At Eyecare Plus, we are dedicated to providing high-quality optometry services in a comfortable environment. Call us at 770-487-2020 or schedule an appointment today online.